A very detailed travel expense report, including miles, non-car transportation, and meals. Spaces to accommodate an extensive approval process, such as that used in an educational setting, is included. I hereby certify that the expenses claimed in this voucher were incurred for official business and the claim is as allowed by the company policy. · Ensure that this claim form is submitted along with the original supporting documents + photocopies of all documents. 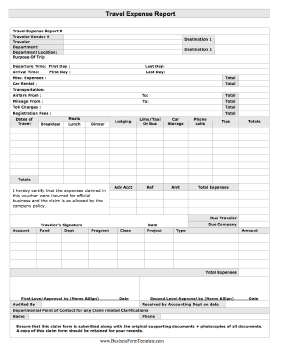 · A copy of this claim form should be retained for your records.